Lucas and I leisurely enjoyed our last breakfast at Casas Brancas and posed for a couple of more pictures before departing for Rio de Janeiro. My first visit to Brasil was a holiday. This visit was unexpected. The next visit will be for my honeymoon (oh yeah, I forgot to mention we decided to take our honeymoon in Brasil). A year ago I would have never imagined that I would be in Brasil three times in less than two years. I stopped trying to plan my life ages ago, since it has a funny way of changing on me unexpectedly. What a ride it has been taking me on and I am certainly excited for this new adventure called marriage! 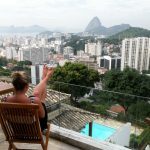 When I was last in Rio, I stayed at an incredible pousada (I highly recommend it), however I wanted to stay in a different part of the city this time and on a whim chose the Rio 180 Hotel, which was rumored to have the best view, hence their name. Well, my whim turned out to be quite the fortunate guess, as this hotel not only did have a jaw dropping view of Rio, but it was also jaw droppingly gorgeous (almost rivaling Casas Brancas)! The owner treated Lucas and I like royalty and within minutes of us arriving she made sure we had caipirinhas in our hands. While Lucas and her chatted about Argentina, I explored the grounds. Lucas and I decided that since we had already spent a lot of time in a car already, that we did not have the desire to take a taxi into the city. Thus, we ordered some take-away to enjoy on the main terrace. As we indulged in some pizza, nutella crepes, and more caipirinhas we watched as Rio changed colors in front of our eyes. I’m so glad to hear how much fun you guys are having in Brazil. And thanks for the hotel recommendations. I would love to visit that hotel some time. Oh my, so beautiful. And the Bridget Bardot pose? YOU NAILED IT GIRL! Brazil looks awesome!!! And what a deal $400 round trip!!! I would LOOOOOOOOVE to go to Brazil sometime – I can’t believe the flights are only $400 RT from here! I’ve still never made it to South America – but it’s definitely the top of my list! that is a nice view! What an amazing view! And a belated congrats on your engagement! Wow! I am just blown away by how beautiful everything is! Glad you like the video and Rio! 🙂 Thank you for the mention! Beijos bonita! Wow!!! I know where I’m staying if/when I make it to Rio. I think the view from your terace is incredible. You must have had great time there.! That hotel looks amazing! Thanks for the travel tip – what an awesome deal. Exciting times ahead for you! As always, you look adorable! I’ve been lusting to go to Rio for some time now. Any chance you might move there to live? 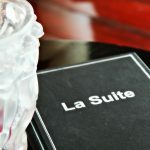 Catching up on your blog – and i love this post. congrats on not trying to control your life. I’m doing the same and it’s brought me back to France. Could you imagine one day moving to Brasil? Oooh I covet that dress! Where did you get it? It looks vaguely Mod Cloth-ish. incredible, precisely what I was in search of. take it easy.. I LOVE your sense of writing. Hey extremely wonderful web site! Just stunning!!! You got a really nice blog there keep it up watching out for most posts. Hey there this is a fantastic post. I’m going to e-mail this to my pals. I came on this while exploring on aol I’ll be sure to come back. thanks for sharing.